The area known as Wisconsin was first inhabited by various Native American tribes. The Chippewa, Menominee, Oneida, Potawatomi and Ho Chunk (Winnebago) tribes lived in the area until the late 1800s. 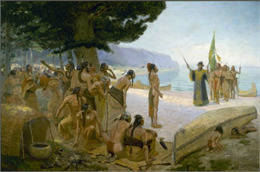 The first European explorer to reach Wisconsin was Jean Nicolet. Searching for the Northwest Passage to China, he arrived in the region in 1634. France laid claim to Wisconsin as part of its territory in the New World in 1672. The Landfall of Jean Nicolet. Jean Nicolet (1598-1642) was the first European to see Wisconsin and was a prominent French explorer. In 1673, explorer Father Jacques Marquette wrote, "The river on which we embarked is called Meskousing. It's very wide, it has a sandy bottom." Spelled in different ways, this name was used for the region surrounding the river. The present spelling, "Wisconsin," was legalized in 1845. In 1763, Wisconsin was part of the territory ceded by France to Great Britain in the Treaty of Paris. Twenty years later, again at Paris, the British relinquished their claim to Wisconsin; and it became a part of the United States of America. In 1787, under the Northwest Ordinance, Wisconsin became part of the great territory north and west of the Ohio River out of which Ohio, Indiana, Illinois, Michigan, and Wisconsin were created. In 1836, the Wisconsin territory was organized, including what are now the states of Wisconsin, Iowa, Minnesota, and parts of the Dakotas. The first territorial legislature met at Belmont about 5.5 miles northeast of Platteville. The two story frame building and grounds surrounding the first Capitol are now a state park. In 1848, Wisconsin became the 30th state to be accepted into the Union. The present Capitol building in Madison was erected between 1906 and 1917 and is the third on this site.